An update on our status is way overdue … a lot has been happening. We are frustrated that we couldn’t get the UK delegation (under Clive Hughes) to propose legal due process for our Mars land Claim at the recent COPUOS legal subcommittee sessions. After some deliberation the UK Gov declined to do so, stating that it would be counter productive. So they have effectively blocked our right to due process, which is clearly challengeable in the UK High Courts. Due process is a natural human right, even for land/property claims. So we are preparing for this route (we did expect this all along) but are still hopeful that further international media attention might lead to our claim being discussed at the main COPUOS session in June. We need COPUOS to agree to afford legal due process for our claim. This may take place in a bespoke UN registry/court or the existing ICJ or the PCA. The PCA have acknowledged that indeed they do stand ready to arbitrate as long as consent is gained from COPUOS. So, what sort of media attention might help us put pressure on COPUOS … well, we have an upcoming interview with the NEW YORKER and possibly the NY Times also. Stand-by for more info on all that. In order to update you, we have included here an email we recently sent to Professor XXXXXXXXXXX, a prominent international space lawyer (he delivered a major presentation at last COPUOS meeting). He is very media savvy and does quite a bit of work with space law and policy news outlets. He is also professor of law in XXXXXXX USA and XXXXXXX, China. In order to help flesh out our interview with the New Yorker we have asked him to contribute. We also might get input from Brian Israel, the recent US delegation leader at COPUOS. So, as well as reading the email to Prof XXXX (below), we suggest you go to the UNOOSA.org website and look at the latest reports from the COPUOS LSE sessions .. it shows that we have poked them a bit … they seem a bit rattled but still they cant reach a cohesive decision. More than ever they need a JOLT to get them to work together to update the Outer Space Treaty before it is completely dropped. Remember, it is still the only thing stopping weaponization or space! Our claim, if legally appraised in a high profile court, might just provide the JOLT that is needed. My name is Dr Philip Davies and I am writing to you in advance of my interview with the New Yorker Radio Show and Magazine. They are very interested in my campaign which has gained growing international media attention over the last 6 months (we have over 14000 members now… and hopefully many more after this interview goes out in the next 2-3 weeks). They would very much like to get the opinion of a senior delegate to COPUOS ( I think Brian Israel is on board) and also a high profile respected space lawyer. The New Yorker would very much like you to add a comment on the matter below (my campaign/claim) for their radio show and magazine. If you agree, I will advise journalist Simon Parkin (simonparkin.com / twitter @simonparkin ) of the New Yorker and he will approach you by email. They would value your comments irrespective of whether you think my campaign is strong and important or silly and futile. I have had extensive conversations with Clive Hughes (UK delegation lead to COPUOS) but alas he feels unable to speak publicly to the New Yorker. I understand Brian Israel (previously the US delegation lead) is happy to communicate with the New Yorker on this matter. I have followed your international input, most recently your valuable presentation to COPUOS LSE in Vienna. I know the New Yorker would very much value some brief input from yourself (either in writing or direct/indirect verbal interview). So, what is this all about?… In Jan 2010 just before the Winter Olympics I was skiing in Whistler, nr Vancouver Canada. I met another skier in a bar who raved on about how the Space Treaty was being eroded and devalued and that this would lead to weaponization of space and nuclear war. Since that encounter I did some reading and felt this guy actually had a point. I am a medical doctor with previous experience in aviation/space medicine (now just a family doctor). I had just started an astronomy hobby so was easily drawn into the detail about the nature of space law and how it might develop. So the Outer Space Treaty (OST) was an amazing achievement 50 years ago … it is very much a child of its time with great focus on preventing nuclear weaponization (WMD) of space. Sadly, with the growing number of space faring nations (and other interested parties), it has became obvious that COPUOS will never manage to further develop the OST in order to keep it relevant to modern space business. Also, the need for committee decisions be arrived through near universal consensus, means they are paralysed. In 50 years they have stood by as the OST stagnated. Finally, and very understandably, the US had had enough. If COPUOS couldn’t update OST or any other space law, then they would have to make their own law … which they did in 2015. Now commercial space exploration and exploitation could surge forward with secure investment of $billions. I agree that USA had to make that decision and their law tries not to deviate too far from the OST articles….. but alas, the very act of making this law is a soft declaration of sovereignty and will always be seen by some other countries as an act which rips into the OST. Although COPUOS is very stirred up by all this they cannot seem to do anything. Other nations are developing their own space laws. This will lead to variable interpretations, friction and a progressive devaluing of the old Space Treaty. In my campaign, I say that if the OST remains the only universally accepted legal barrier to nuclear weaponization of space/orbit, then we must do all we can to keep it relevant and respected. That means updating the OST to include a little bit of framework for space business and a bit of tightening up against non-sovereign celestial land acquisitions. Then, in its entirety (perhaps with some further tightening against earth based space weapons and dual use space equipment), the OST can remain important and pivotal to space conduct and safety. So, I have been running a campaign to “Save The Space Treaty” … but I always knew that a lobbying campaign (even with good social media application) would not really get anywhere with COPUOS in its current paralysed state (indeed this can be said of the entire UN unfortunately). I needed something that would give them a JOLT .. a strong stimulus to focus their efforts. I needed to sting them into summoning up the spirit of 1967 and update the OST, despite those known difficulties in gaining consensus in such a large dysfunctional committee. I had an idea .. I remembered being given a gift by an ex girlfriend in the late 1990s…. it was a deed certificate to some acres on the moon. I was slightly disappointed to find a small “novelty gift” stamp in the corner. Yet the company issuing these things was outwardly declaring a genuine claim to the moon and other celestial bodies (without any real legal basis). I couldn’t help feel that these guys had been lazy .. they could have done a lot more to justify their actions instead of misleading consumers with declarations of true ownership and then stamping the deed certificates as just novelties. First, I should tel you about my Mars land claim and why I think it can serve to save the Outer Space Treaty. This of course is why the New Yorker was interested (and other international media in UK, Australia etc). I can say that my claim is honestly made and is truly grounded in current international law, sufficient to deserve the “right to legal due process”. An international court will need to appraise my claim. It is true that a judge may choose to adjust upwards the existing proof requirements (in international law) for possession of geographically equivalent land on Earth, in order to protect the strategically more valuable Martian lands…. but that is challengeable and still means that I can show that space law and the OST could not prevent my claim with any significant strength. Thus through such a high profile case, I would be able to embarrass and jolt COPUOS into updating the OST. Is that dangerous?… could I end up further weakening the very thing I want to protect? Clive Hughes (UK Gov) thinks so … but I can see that the OST will be eroded anyway unless I can dramatically prove the need for OST revision. In international law (just as in private law) there is consensus that the proof bar for possession (actual possession or effective occupation depending whether an individual or a sovereign nation), and thus right to gain ownership of new/unregistered/unattended land on Earth, is very much dependent on the quality and location of the land claimed. The great international lawyers McDougal and Lasswell (Yale) did a lot of the good work on this and also on space law leading to the OST. Three categories of land was described… Cat 1 was ready for human settlement and ripe with resources for trading. Thus to prove possession, the occupier must actually settle the land and prove trade. Cat 2 was a rather lesser category. Cat 3 was rather barren, distant, difficult land where human settlement and trading of resources would be tricky. Polar areas, Greenland and some barren islands (Las Palmas and Clipperton) were examples. For these areas, there was not a need for pedis possessio or settlement, nor proof of trade. You just had to show intent to possess, show some governance activity (ideally showing some control) and ideally show actions to improve/make ready the land for human settlement and trade. Acknowledging that even very powerful lasers targeting Mars from Earth can only have a very tiny effect, I assess that this is for an international court to decide. My lasers (3500 mW, being 3500 times stronger than standard laser pointers, but still legal to use responsibly) are housed and deployed on an astronomical telescope which operates on an accurate GOTO mount, thus fixing and following Mars for prolonged periods whilst I survey the skies visually and by flightradar24 app for any encroaching aircraft. With rigorous standard operating procedures, I have been lasering Mars for 7 years in support of my Mars land claim. This clearly sounds crazy, but I deploy the lasers maybe 1-2 a week when I am inclined to go stargazing on clear nights (usually outside the operating hours of any airport within 40km). So what tiny beneficial effect might laser light provide to land on Mars? … well, just look at any text on the future plans to ‘Terraform Mars’ (wikipedia does a typical piece on this). They always describe the need to generate an atmosphere on Mars. The application of light/heat (either by laser or nuclear means) to mainly the polar regions will liberate CO2 as gas from the dry ice. Just a 3 degree rise in polar temperatures would cause a greenhouse effect enough to generate an atmosphere (not to breath but to allow astronauts to operate without pressure suits … just breathing apparatus. Ok, that’s all a bit simplistic but what I can say is that when Mars is closest (at opposition every 2 years) I am showering the planet with ~4.5 quadrillion laser photons per second = >120 photons per square metre per second. That would be measurable above other light radiation using a sensitive detector on Mars. The blue photons carry high energy which can release CO2 gas by sublimation (as described above) and may also liberate water from any remaining ice. It is also true to say that any remaining primitive photosynthetic life will benefit from the high energy blue laser light. It is currently thought that high energy blue light might have started life on Earth by breaking organic chemical bonds. You can see several videos of my celestial laser usage (including Morse code messaging) in the media section on my website (see below). It will be for an international court to decide if, in support of my Mars land claim, the beneficial effect of my lasers is small and legally trivial (so application for registration rejected) or small but still legally relevant (application for registration accepted if other factors favourable). Together with my plans for a Mars Trust under UN Trusteeship (a space savvy panel/council, not a full committee), I have undertaken other governance actions and I have, as required by International law, openly declared “exclusive possession,” using radio, internet social media and by targeted laser Morse code (Morse code applied to a laser beam targeting Mars, using an android app to control the message). Well, given that COPUOS created and ratified the Outer Space Treaty, the cornerstone for all space law, it is logical that they should have a direct say on my right to due process and the nature of that due process. OST article 3 states that International law does apply to space matters, so we know that the existing proof requirements for land acquisition (on Earth) can be applied to this situation. A suitable court might be a bespoke UN entity, the ICJ or the Permanent Court of Arbitration in The Hague (PCA). The PCA is perhaps best placed since it has recently arbitrated on a big land claim dispute between China and Philippines. It has recently developed optional rules for arbitration of disputes arising from Outer Space issues. The PCA Deputy Secretary General, Brooks W Daly (also principal legal counsel), was fascinated by my claim and stated that the PCA was capable and stood ready to arbitrate on the merits of my claim (either just the “right to due process” or the actual “first registration” application). He clarified that consent would first be required from UN (COPUOS). Thus, I gained good advise from Niklas Hedman (Chief @ CPLA UNOOSA) that whilst he appreciated the goals of my campaign, the UN Sectretariat could not act for me; I would need to get a nation member state to raise the issue at COPUOS session. Thus I have applied pressure to several delegations (US, Canada, Aus and UK), but mainly the UK delegation. I had extensive email conversations with Helen Mulvein (legal counsel for UK at UNHQ ) and Clive Hughes (UK delegation lead at COPUOS). In the end they realised that my claim, based on laser applications to Mars land, was relatively impervious to OST articles. Article 1 was too vague. Article 2, 6 and 8 did not apply (non sovereign, no in-space activity and no actual objects sent to space … photons are defined as massless particles/waves, not objects). Once the penny dropped, Clive asked for more time to consult and consider. In the end, even though he realised my beneficial goals (and he agreed with them for the most part), he said that they could not propose to COPUOS that my claim be legally appraised. He stated that the reason for the UK decision to block my route to due process was because my claim could prove counter-productive. So that recent refusal has created the opportunity to now challenge the UK Gov decision to block my claim without opportunity for legal appraisal. I intend to challenge the decision through the UK High Court. I have a good expectation for success, but regret that it will take some months. This is a pity since this year is the 50th anniversary of OST .. it would have been ideal to have a high profile legal appraisal of my claim take place this year. Hence I have not completely resigned to dragging government through the High Court. It might be that with further media attention (like this interview with New Yorker and another possible article in NY Times), sufficient public pressure could encourage discussion of my claim at the next COPUOS session in June. Brian Israel (ex US delegation leader) did respond to me quite favourably, but perhaps that was because he was in the act of handing over to Gabriel Swiney! I have just seen the latest draft documents/reports from LSE COPUOS. It makes for exasperated reading. Lots of debate, some disharmony but no cohesive result. No change there! I saw your presentation. You appear to have come round to the opinion that existing space law just might tolerate the current US plans for commercial space exploitation. I still think the situation is still way too vague. I do worry that when the time comes for US companies to set up mining sites on Moon, Mars or asteroids, there will be a lot of protest and potentially conflict. I also think that once commercial ventures arrive on celestial land, acquisition might feasibly be attempted despite some modest/moderate obstacles in space law. Nuclear weaponization of near space seems more likely with the weakening of OST. This all needs tidied up. 1. Is the OST in danger of being dropped altogether, never mind eroded (I think this is starting to seem possible)? 2. Is there anything else in law which might be uplifted to prevent nuclear weaponization of space if the OST is dropped or further weakened? 3. Did the US Space Act rip into the OST? … it seems to me that the very creation of the Act is declaring some sovereign authority. I can see some nations believe this ‘broke’ the OST. 3. Could a less benevolent nation reasonably place nuclear components into orbit as a ‘precautionary measure’ with the excuse that they are not the first to ‘break the OST’ (see US Space Act 2015). 4. I agree that the US did have to develop their own space law and think they have been quite open/honest about it. Unfortunately it may have consequences for the OST and space safety. I would love COPUOS to update OST to have at least some of that framework to permit space commerce. Do you think the US is still interested in developing the OST?… or does it think the OST is a dead duck? 5. Do you think that an imaginative celestial land claim could, in a high profile legal setting, be shown to penetrate all space law (perhaps only being stopped by uplifting Public International Law). If so, could that be enough to sting COPUOS into action (updating OST), or would it just damage OST further and lead to its earlier demise? 6. Do you think that UN trusteeship of near space (solar system) is a workable idea? If we won our claim to Mars land we would not run away with the land… our declaration of intent states that a Mars Trust would be formed with a UN council as Trustee and all Mars land claimants as contingent beneficiaries. 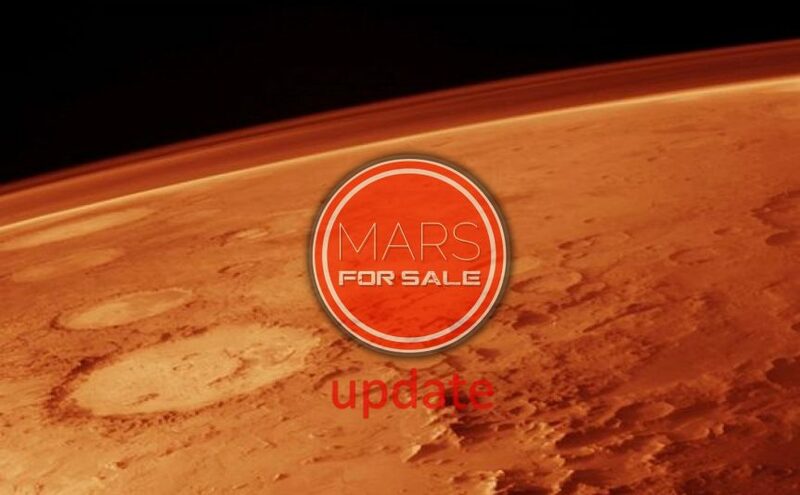 The UN trustee would then be able to gain all shares to the the Mars land for a nominal fee as long as the OST is updated to the satisfaction of General Assembly, UN. So you see, we dont plan a reckless land grab. We are legally selling part of our Mars land claim (just as a land squatter might sell off part of his share with other squatters prior to first application for land registration). This raises funds (1 cent gets up to 10 acres… yes, a tiny fee) for the looming legal process. It also gains vocal numbers for our campaign. If we are successful, we might get COPUOS to update the OST. Although most unlikely, we might even get land title registration!!! … but even in that case the UN would be the controlling Trustee and could take the land from each claimant for just $1000 (a nice dollar reward for our claimants but a tiny sum to UN) as long as it did manage to update the OST. It could then administer to celestial lands under UN trusteeship, granting limited mining rights under controlled circumstances. If it fails to update the OST within 10 years, then the Mars Trust is dissolved and all claimants (contingent beneficiaries) will gain a plot of mars land by deed. Academic lawyers have favourably advised me that there is reason for mild optimism through this claim. Not only might it spark a flurry of space law activity, it might be that a Judge in an international court would find the prospect of UN Trusteeship of celestial lands to be quite attractive… especially when compared to the current messy alternative. Thus we might even get title registration after all, thus guaranteeing some future structure and framework for space commerce, with limited contracts signed off under watchful UN trusteeship. My twitter page appeals to the campaigners out there whilst the website appeals to people who like the idea of a little speculative chance of owning a slice of Mars land (or just want to buy someone a legal and unusual gift). That’s how I am raising my legal funds (not quite enough for PCA due process just yet! … I’ve seen how much it can cost!). I would value your expert opinion. Let me know if you are happy to talk to the New Yorker.